The strength of an organization is the differences found among the people who comprise it. Your firm, office, department, or project team is blessed by the diverse perspectives, skills, and experiences of its members. Your job as leader is to leverage those varied assets for success. But alas, these same differences can be problematic. They can inhibit consensus building. They can lead to misunderstandings. They can undermine collaboration. And they can contribute to conflict between people. Occasional conflict should be expected in any organization. It's a product of our humanity, and to tell the truth, some measure of conflict—properly managed—can be constructive. But persistent conflict can afflict a company like cancer. It has the capacity to poison the work environment, impede productivity and quality, and promote employee turnover. Address lingering conflict early. The longer it persists, the more difficult it is to effectively resolve it. This is where my earlier characterization of conflict as cancer is particularly apropos. Left untreated, conflict tends to spread and become more deeply rooted. I've seen relatively minor disagreements grow over time into paralyzing hostility, drawing others into the fray in the process. As a leader, you can't allow conflict to fester in the ranks. Think it's unsavory to stick your nose into it now? It only gets worse. Obviously, some root causes are easier to resolve than others. But you will benefit from better understanding what's really behind a conflict in any case. Simply acknowledging the root of the discord is helpful, even if the cause cannot be readily remedied. When you're probing for understanding, take care to avoid putting the involved parties on the defensive with your questions. You may well have to confront misbehavior later, but start the process by encouraging open dialogue and diagnosis, without jumping to judgment. Focus on the issues, trying to keep emotions under control. Damaging conflict typically is more emotion-driven than issue-driven. People will tell you that it is about this or that matter, but the real problem is how it makes them feel—and consequently how their feelings influence their actions. The root cause may be issue-driven, but the resulting conflict usually is propelled by emotion. So you want to try to quell the emotion to begin working on the solution. Set the tone by your own response. Don't let yourself be pulled emotionally into the fracas. Be calm, open-minded, empathetic. If both parties are present, don't let the dialogue escalate into an emotional outburst. You can encourage them to share how the conflict has made them feel, but instruct them to keep the discussion as constructive and unemotional as possible. 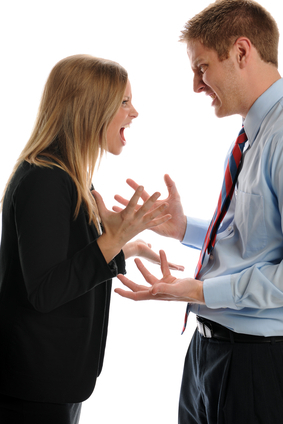 Restrain personal attacks in negotiating a resolution. Nothing intensifies conflict more than letting it get personal. If the fight has warranted your intervention, it probably has already crossed that line. One or both parties has gone beyond attacking opinions or perceptions, to disparaging or demeaning the person holding them. You won't be successful disarming the conflict as long as personal attacks continue. Some people don't seem to be able to disagree without being demeaning. This tendency is all too evident in the public square these days—witness the political and cultural debates that routinely stoop to impugning the character and motives of the other side. In resolving conflict, you'll want to set boundaries regarding personal attacks, both by helping the involved parties recognize what behavior crosses the line and intervening when that happens. Make resolution the priority rather than winning the argument. In the tug and pull of conflict, both sides are usually focused on coming out on top. But mediating the conflict should be directed more to negotiating a truce than declaring a winner. What if it's clear that one side is right and the other wrong? Don't compromise truth for the sake of resolving conflict; instead work to persuade the erring party about the correct position. Try to find a third alternative before settling on a compromise. Many a conflict is resolved through compromise, but that often requires both sides to give some ground on something they believe strongly in. A better choice would be to find another alternative that both can embrace. It's not always possible, but it's certainly worth exploring. Seek apologies and forgiveness when appropriate. According to one informal survey of business executives, there's a common sentiment that forgiveness is a philosophical or religious concept that is inappropriate to discuss in the workplace. I respectfully disagree. Offering apology and extending forgiveness are so indispensable for healthy relationships that I cannot imagine why we would want to ignore its value in the context of workplace conflict. This is the equivalent of pushing the reset button. You cannot effectively resolve conflict as long as there is lingering resentment. What better way to end hostilities than for both sides to offer a sincere, "I'm sorry; I was wrong. Please forgive me."? Of course, you accomplish little by pushing people to mouth the words. Instead you must convince them, privately, that this is the right thing to do. Define practical, achievable corrective actions. Whatever circumstances and actions led to the prolonged conflict should be corrected if possible to prevent recurrence. Plus resolving the conflict usually requires still other specific actions. Determine what steps are needed, working in concert with the affected parties as appropriate, and seek their commitment to do their part going forward. Then monitor and reinforce follow-through. By the way, if conflict and discord are relatively common in your organization, you want to examine the reasons why. Organizational culture plays a big role. I've seen firms where managers can argue passionately with each other, even seemingly crossing the line in personalizing the conflict, only to consistently resolve the matter successfully. In such firms, I've found there's usually a strong value for acting in the interest of the whole—in other words, the organization ultimately wins most every argument. In other firms, such clashes are rarely constructive because of prevailing individualism and self-interest. What about your firm? Do your people tend to fight for the right reasons? If not, you will be wise to establish ground rules for airing dissent and treating differences with respect. The goal is not to eliminate all conflict, but to harness it for the good of the organization and your employees. Like fire, conflict can burn and destroy, but can also be controlled to generate energy and light. Really great information. I thoroughly enjoy and learned a lot especially what you said about the reasons of conflict at workplace. Thanks again for sharing with us.